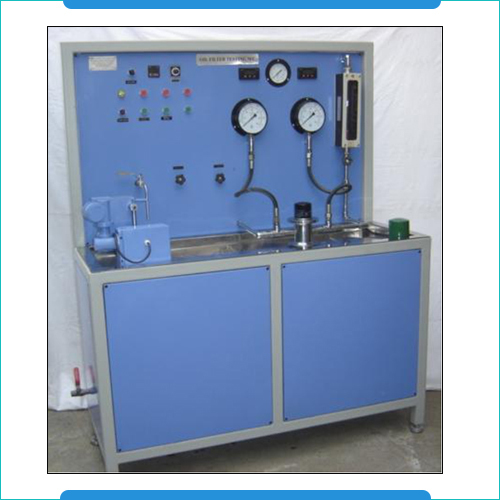 The Fuel Filter Testing Machines are used for determining filtering efficiency using contaminated fuel (diesel) at rated flow, inlet pressure and ambient temperature. These are available in fully automatic PC interfaced version as well as in basic electro-mechanical manual version with three stainless steel tanks having conical bottom and capacity of 50 ltrs. Further, the top tank is fitted with cover and stirrer is fitted to two top mounted tanks. With operating power requirements of 3P, 440 v, 50 Hz 3kwatts and speed adjustable provision to 200rpm, these come with 0.5 HP pump and motors, 12 mm inner pipe diameters, and o-1 ba pressure measuring device. Top tank fitted with cover. Stirrer fitted to two top mounted tanks. Pump and motor rating 0.5 HP. Pressure measuring device 0-1 ba. Power 3P, 440 v, 50 Hz 3kwatts. The Oil filter testing machines help in cleaning the oil that circulates through lubrication system and save engines from faulty oil filters that might result in choking up of internal combustion engine. 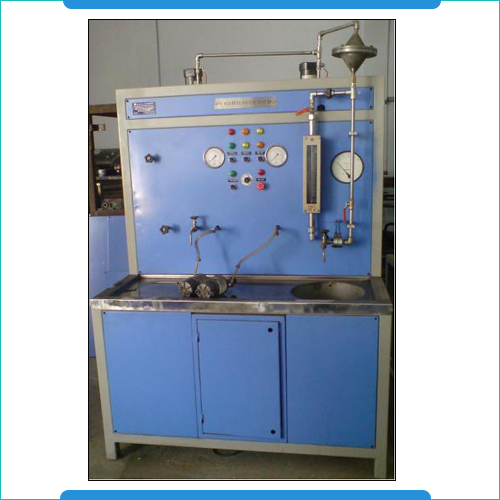 The oil filter testing machines come with thermally insulated tanks that have conical bottom and a capacity of 50ltrs. These tanks come with digital temperature indicator controllers, are electrically heated and feature on/off valve fitted on the conical bottom. Having pumping capacity at 1500rpm 15bar 12 lpm, these also feature by-pass circuit that is fitted with pressure regulator (needle valve) and operating motor of 3Ph.,440V, 5HP 1440rpm. With capacity of slurry adding equipment of 02 ltr and flow rate dispensing of 01ltr in 4hrs, these also come with the throttle valve for adjustment of flow rate and flow meter for conducting full flow as well as for bypass flow test. Tank with conical bottom capacity 50ltrs. Tank electrically heated with Digital temperature indicator & controller. Conical bottom fitted with on/off valve. Pump capacity at1500rpm & 15bar 12 lpm. By pass circuit fitted with pressure regulator (Needle valve). Throttle valve for adjustment of flow rate. Flow meter for full flow and for Bypass flow test. Capacity of slurry adding equipment 02 ltr. Flow rate 01ltr.dispensing in 4hrs.